Please be advised that this event has past. Hi StephanieM. Thank you for joining us the event. We are thrilled to hear that you had such a lovely time! Thank you to Beauty South Africa and Black Up for an amazing experience!!! I loved learning about yellow, gold, copper and blue undertones. What a lovely event! WOW and YAY! I can’t believe I actually won a place for this! I am so über exited and I can’t wait. 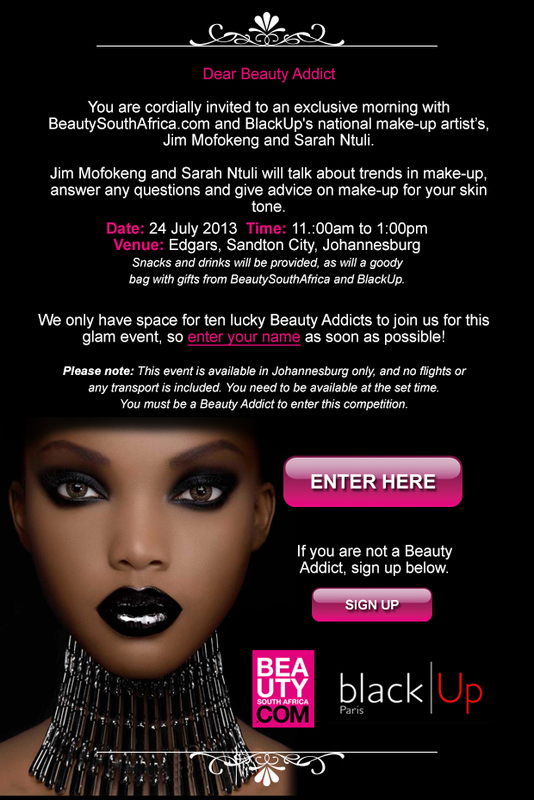 Thank you so much to the ladies at beautysouthafrica.com for organizing this event! Hi Lynne. We have a lot of exciting events in the pipeline for Cape Town. Keep an eye on the website for updates. When will you be coming to Cape Town? If only I lived in JHB. So sad for me. Yes we need one in DBN too. I am in Durban, KZN, would have loved to attend. :( I am in Durban…….. I would have loved to be a winner. What a great event! Hopefully I will be chosen! At last it came to JHB! Pick me PLEASE! Oh my word, I would love to enter this, but I live in Cape Town! Something you must do in Limpopo area too!